The French word Peridot, pronounced ‘pear-ee-dough’ was given to the beautiful green gemstone by the French mineralogist by the name of Hauy. The origin of the word Peridot is unknown to date. It was written that Peridot was discovered by pirates and called the greenish, yellow gem Topaz because the stone was found on the island of Topazios in the Red Sea. Surrounded by shark infested water this small and desolate island, where nothing grows due to lack of fresh water and the heat is unbearable, was the only ancient source of Peridot. The island Topazios was renamed Zeberged, the Arabic word for Olivine. Peridot belongs to the mineral group Olivine. The oldest Peridot jewelry known is a strand of Peridot beads which was discovered in Egypt circa 1580 BC. 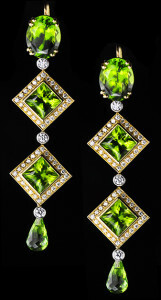 Ancient peridot jewelry is also found in intaglios from the Greeks & Romans. Crusaders brought Peridot back to Europe, preserved and adorned by the Catholic Church. Highly prized during the Ottoman Empire (circa 1300), the Turkish Sultans amassed the world’s largest collection of Peridots. The collection in the Istanbul Topkapi Museum includes a gold throne decorated with 955 Peridots, jeweled turbans and boxes decorated with extraodinary Peridots. Considered as a symbol of the sun, Peridot is often associated in lore with sunshine. Early Greek writings record that Peridot bestows royal dignity on its wearer. Marbode wrote, ” Peridot protects its owner from evil spirits when the gem is pierced and strung onto the hair of a donkey and then tied around the wearer’s left arm.” Wearing an engraved peridot with the image of a torchbearer (a symbol of the sun), the stone will bring wealth to its wearer. 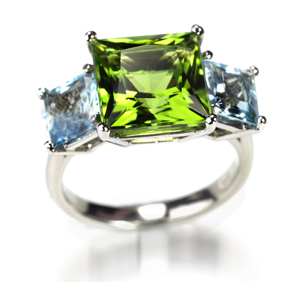 The ideal color of Peridot is a pure “lime” green with no black or white inclusions. A hint of brown or yellow will diminish the value, as will flaws within the stone. The green color varies depending on the percentage of iron content, more than 15 percent gives an overall dark “blackish green” color which is unsuitable for it to be classified as gemstones. Peridot may be confused with green Tourmaline, green Zircon,green Garnets, Chrysoberyl, Diopside and Sinhalite. Peridot is a soft stone with the hardness 6.5 on Moh’s scale. Most commonly found as rolled pebbles on the ground and on beaches, it is rare to find well formed crystals that grow in vertically striated flattened prisms. Some of the best gemstone quality Peridot with bright green crystals is found north of Mogok, Myanmar, on the northern slope of Kysukpon in a weathered serpentine rock. The finest Arizona Peridot comes from the area of the Peridot Mesa on the San Carlos Apache Reservation. Hawaiian Peridot is found on the beaches. 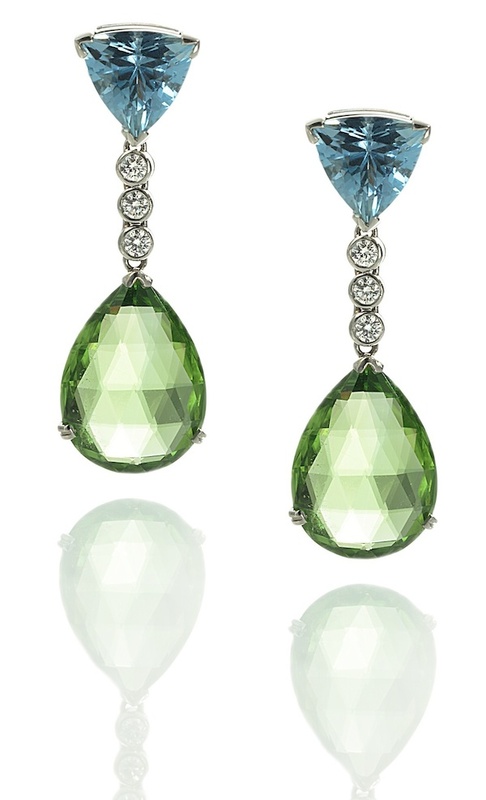 Gem quality Peridot is also found in Brazil,China, and Antarctica and from Tanzania & Kenya. Peridot is one of my favorite gems to design jewelry with because of its unique and vibrant green color. With perfect crystal clarity a Peridot has a particular glow and liveliness that no other gems have. Because of the particular green color– I often combine Peridot with deep purple Amethyst, hot pink Tourmalines or pale blue Aquamarines, giving a wonderful contrast. Most of the Peridot I use is from Africa and is precision cut in Idar Oberstein,Germany.